It was in 1903 that the masters of Wellington College first talked about golf - or, at least, a golf course - and being men of action as well as enthusiasm, they formed a company and bought sufficient land on which to lay out a course. For the first few years the Club flourished, but some six years afterwards there was apparently a depression, and the records of the Club show that the Company which had been formed, sold their land to Mr. Howard Palmer J.P., the head of the famous biscuit firm from Reading which bears his name. But the change in ownership of the land proved a blessing indeed, for the new landlord granted a lease of the course to the Club on most advantageous terms, a lease which has since been renewed with the same generosity. In fact, since Mr. Howard Palmer's interest in the Club, the family have retained their connections with it. We owe great thanks to the four principal founding members; Armstrong, Upcott, Fitzgerald and Palmer. Their vision and passion for golf has been celebrated by naming the four centenary bridges (7th, 13th, 14th and 15th holes) in their honour. Originally designed by Peter Paxton, who was adept at using the natural water courses that flow on the land to guard the greens. Heather too was used as a feature to provide cross hazards on some of the longer holes, reducing the need for bunkers and maintaining a natural look to the course. These natural barriers and cleverly designed doglegs mean the course plays a lot longer than the 6,200 yardage suggests. Coupled with fast undulating greens, this makes for a real challenge of not only a players striking ability but also their discipline and course strategy, as the competitors of the annual East Berks Stag will testify. 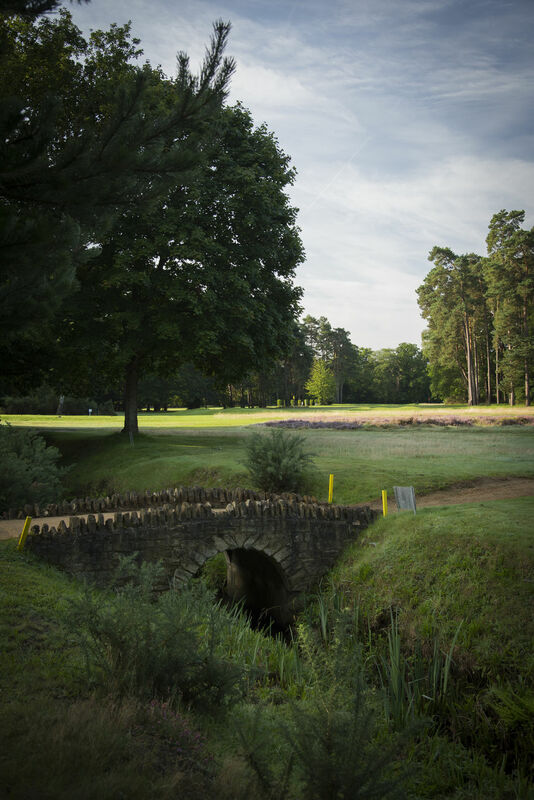 From its origins as a heathland course, East Berkshire has matured into a tree-lined course of great beauty. Shaped fairways leading into well-defined semi rough helps to identify the driving areas and carefully placed greenside hazards ensure that wayward shots go unrewarded. East Berks' famous guests are too numerous to mention. The South Africans Bobby Locke and Gary Player were frequent visitors to the club in the 60's and 70's. More recently Luke Donald played in pursuit of 'The Stag', the club's premier amateur competition. The current course record is held by Scott Fallon with an outstanding 63, shot during his victory of "The Stag" previously won by Sandy Lyle in 1976.